The Aussie seems to be very vulnerable. 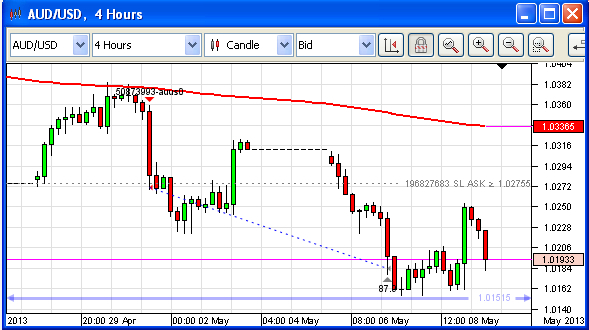 The Omicron Forex Silver Trigger routine entered AUDUSD on the short side on the 1st. of May and so far has been nicely rewarded. The drop that paid dividends came about because of a "surprise" (it was not a surprise to us) cut in the RBA cash rate. There was something of a recovery to the upside on the pair yesterday after better than expected news out of China, to where Australia exports significant quantities of commodities, mainly Iron Ore. However, this uplift is far from convincing and the pair is now poised to drop through an important support level (see weekly chart above). As can be seen from the 4-hour chart, the gain on the China news has been nearly all given back. The ostensible driver for this was a fall in unemployment which, perversely, results in a fall the currency because of the fear that it will lead to more interest rate easing. We will remain short the Aussie. 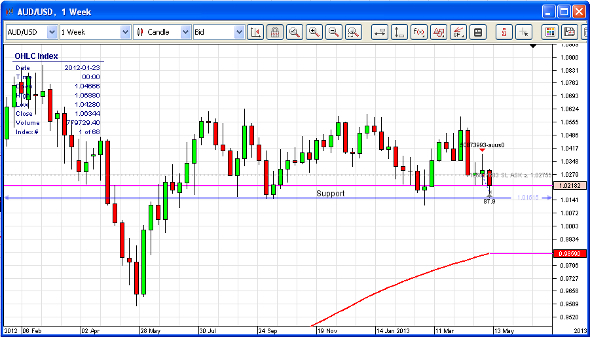 (Also note the bounce off the 200 period Simple Moving Average (SMA) in the 4-hour chart at the end of April).